The third season of archaeological fieldwork carried out by the Polish Archaeological Mission “Tyritake” from the National Museum in Warsaw in the ancient town of Tyritake (Kerch, Ukraine) took place between 22 July and 29 August 2010. The research is carried out within the framework of a Polish–Ukrainian program for cooperation established between the National Museum in Warsaw and the Kerch Historical and Cultural Reserve in association with the “Demetra” Foundation. In keeping with agreements signed between Poland and Ukraine and the letter of Ukrainian law, the “Tyritake” Mission is part of the Ukrainian “Bosporan city of Tyritake”, project directed by Prof. Victor Zińko. The actual fieldwork began on 23 July and was completed by 21 August 2010. The first week of the work, through July 30, was supervised personally by the mission director Alfred Twardecki; after that the mission’s deputy director Marcin Matera took over. This season the team included members from Poland and Ukraine, as well as staff and students from the Faculty of History of the University in Belgorod, Russia (who participated in the work from 2 to 14 August 2010). The last five days, from 22 to 27 August were devoted to completing the photographic and drawing field documentation, even as an appraisal was made of the uncovered structures by members of the local conservation unit in an effort to prepare for the preservation and partial restoration of selected parts of the site for sightseeing purposes. The survey was essential in order to choose the proper techniques and materials for the conservation work. Geodetic measurements were taken in the course of the season. Marina Riabtseva, Sergei Prokopenko, Ol’ga Cherkashina, Ekaterina Krasnikova, Eugenii Gushchin, Natal’ya Kolomiets, Gleb Nikitin, Iulia Babich, Ekaterina Repina, Margarita Luzhkova. Last season, tracing of the borders of a trench dug previously by Prof. V. F. Gajdukevich made it clear that excavations of Trench XIV had not been completed. The outbreak of World War II may have stopped the fieldwork or else Gajdukevich, realizing the importance of the findings, made the decision to leave sections of the trench unexcavated once he had reached Classical and Archaic cultural layers. The textbook importance of the Archaic-period discoveries made by Gajdukevich and the artistic excellence of some of the finds, especially considered in the light of their significance for the early history of the site, have kindled hopes for finds of comparable quality in the relevant cultural layers located in undisturbed parts of the site. Last year’s discovery of a fragment of wall with Archaic bondwork (wall 17) running perpendicular to the already known defense wall (wall 7) confirmed these assumptions, while the fact that wall 17 turned out to be founded directly on top of wall 17 threw new light on the early history of the site. In effect, the Polish and Ukrainian heads of the project decided to continue fieldwork in an area unexcavated by Gajdukevich on the west side of the defenses (western part of squares 20-21). Preservation of the discovered remains being one of the obligations undertaken by the Polish Archaeological Mission, it was decided at the close of the 2009 season to protect the uncovered substance of the Archaic-period defense wall from the impact of harsh winter conditions and to organize this sector as an educational site for visitors. The Polish side provided the funds and by October 2009 Ukrainian conservators had completed the work, which was carried out under the combined supervision of the Polish and Ukrainian heads of the project. This changed the situation in squares 7 and 8, resulting in a joint decision to desist from further excavations in these squares, as well as 1 and 2 (defense wall and stone pavement 1), and instead to continue fieldwork in square 20, already outside the borders of Gajdukevich’s old trench XIV. Last year’s excavations in squares 12-14 (adjacent to trench XIV on the east) had revealed a thick (0.40 m and more) accumulation of modern construction rubble, mostly concrete slabs, from the times of the Soviet Union, the same that was found in squares 1-6 previously. This gave reason to think that the unexplored area between squares 12-14 and 4-6 was covered with similar fill resulting from the fact that the area of trench XXVII had been a construction site for barracks used by workers from a neighboring factory and shipyards existing in the 1920s and 1930s. Army fortifications replaced many of the standing buildings during the extended bitter fighting in World War II and then, after the war, the area was leveled, backfilling also Gajdukevich’s trench XIV, as a result of which the modern fill there is much thicker than in the newly uncovered squares 12-14 located already outside the borders of his trench. Consequently, it was decided to remove this modern fill by mechanical means in an effort to speed up the archaeological work. One task that had to be undertaken before more work could be done was the renumbering of squares, especially squares 7 and 8, which had been traced last year, on the basis of a trial pit which had been dug to verify the idea that trench XXVII corresponded to Gajdukevich’s old trench XIV. The squares measured 5 m (N-S) by 7 m (E-W). The western part of squares 7 and 8, 2 m long, was now included in the new square grid. The squares traced this year were also given new numbers: 15 through 21. At the same time, part of the backfill of Gajdukevich’s old trench XIV in the central part of the site (all of or part of squares 10 and 15 through 18) started to be removed mechanically by means of a dredge-excavator. Also the modern layers from the 1940s–1970s were removed from square 11. This part of the work, which ended on July 26, was personally supervised by the respective Polish and Ukrainian heads of the project. Altogether rubble and earth about 0.70 m thick were removed from an area 10 m wide (E-W) and 15 m long (N-S). Even as the drawing documentation from last season, especially the trench sections in squares 4-6, 12 and 14, was being verified in the field (27 to 29 July 2010), archaeological fieldwork began in squares 10-18, the eastern end of squares 4-5 and square 20. The first step was always to clean the surface, both in the trenches started during the previous season and in the areas now cleared by mechanical means. In the previous season excavations in squares 4-5 reached levels oscillating between 16.56 and 16.35 m ASL (all levels subsequently in this report are given in meters above sea level). A section in the eastern part of the squares was investigated this year, 3.20 m wide by the southern border of square 4, narrowing to 2.50 m by the northern border of square 5. The cultural layer identified in 2008 by the southern side of square 4 and partly explored in 2009, was now cleared down to the level of approximately 16.55 m.
A section of pavement was discovered at 16.23 m in the northeastern corner of square 4. The northern edge passes without any clear border into what looks like tumble, less likely street paving; further work in this part of trench XXVII should resolve this issue. Pavement 5 extends approximately 1.60 m to the south of the northern border of square 4 and about 3.00 m to the east of the unexplored this year part of square 4. Pavement 5 was made of small and medium-size limestone cobbles. It seems to have been uncovered by Gajdukevich as indicated by the finds from its surface: bottom of a modern glass bottle, pieces of modern metal objects and a 10(? )kopeck coin from 1931. It should be noted, however, that the localization of this pavement does not match the localization given by Gajdukevich for the pavement he discovered more or less in this part of trench XIV. The archaeological layers uncovered in squares 4-5 should be considered part of the backfill of the old trench XIV excavated by Gajdukevich. They are of modern origin and contain much mixed archaeological material. In square 5 investigations were stopped at the level of the modern stone tumble. The investigations in squares 10-11 started with cleaning of the surface reached by mechanical clearing (17.30 m by the western limits of square 11, dropping to 16.50 m by the eastern limits of square 10). Two features became visible: feature 2 (O-2) in square 11 and partly in square 12 and pit 7 (J-7) in square 10. Feature 2 (O-2) appeared as three roughly square discolorations of dark brown color, separated by two bands of undisturbed cultural accumulations, each 0.20 m wide. The eastern end of this feature was found already in square 12 (over a distance of 0.40 m), while the western end had been damaged by a modern trench (possibly entrenchment dating from World War II) approximately 1.10-1.80 m wide, aligned N-S and following the western wall of the trench from the northern end practically through the whole trench. The feature itself was aligned E-W, angling slightly toward the north in the eastern part. Its southern border ran at a distance of approximately 1.00 m (western part) to 1.30 m (eastern part) from the southern limits of square 11. Its overall length approached 3.60 m. Each of the three square discolorations (numbered A, B and C successively starting from the east) was about 1.20 m wide, the length being respectively: A, 1.30 m, B, 1.10 m and C, 0.80 m (the end of this depression had been destroyed). The bottom of 2A and 2B was located at 17.07 m, that of 2 at 16.86 m.
The function of this feature could not be determined, but its unusual shape and its proximity to what is believed to be a WWII trench suggest some kind of gun emplacement. The archaeological material in the fill of this feature is hardly a chronological indicator, being largely mixed despite the presence of four diagnostically sound sherds, which are: rim and body sherd of Black Sea amphora, rim of a red-slipped bowl of LRC form 3 and rim of a small jar from the Saltovo-Mayaki Culture. It should be noted, however, that there were no modern artifacts in the fill. Pit 7 (J-7) was located in square 10, approximately 0.90 m to the south of the northern trench wall. On the eastern side, it may have originally disappeared under the baulk but is now destroyed by the same modern pit that obliterated the western end of feature 2 (O-2). It measured approximately 2.60 m (E-W) by 2.20 m (N-S). The bottom of the pit was measured at 16.70 m. The artifacts discovered in the fill of the pit date the feature to the early medieval period. Investigations in squares 10-11 were temporarily suspended following the exploration of the two features O-2 and J-7. Work in squares 12-14 commenced with standard verification of drawing documentation from the 2009 season, following which it was possible to remove the baulks between squares 12 and 13, and 13 and 14, and begin excavations of the Early Byzantine layer identified in the section between the limits of the old trench XIV in square 16 and the western border of square 14. The top of a wall was uncovered at 17.50 m, situated on the border of squares 14 and 16. Wall 18 is of Early Byzantine date and is part of the architectural complex IV discovered in 2009, comprising walls 8, 9, 10 and 13, as well as this year’s discoveries, walls 29 and possibly also walls 30 and 31. It formed a corner with wall 13, which joined it in an arch, not at right angle. The bondwork in wall 18 was irregular, consisting of small and medium-sized stones (west face) and a few big blocks and medium-sized boulders (east face), bonded in clay mortar. It was 0.55 m wide and was uncovered for a distance of 1.85 m. At the southern end it touched a pit (J-2), which contained a pithos made of orange clay; at this point, the wall was 1.10 m away from the southern limits of the trench and rising to the level of 17.52 m. Its northern end was preserved to 17.26 m. The foundations of the wall were recorded at about 17.10 m at the southern end and about 16.93 m at the northern end (giving 0.55 m as the total surviving height of the wall in the highest spot). The foundation substructure was approximately 0.20 m high, made of clay mixed with charcoal. Wall 18 was aligned N-S, 15º off to the northeast, turning northeast at the northern end so that it diverges from magnetic north by about 40º. Walls 18 and 13 were drawn and photographed, and subsequently dismantled in order to proceed with the excavations. The stone material used to build the wall proved to consist in part of reused material: an anthropomorphic stela fragment in wall 18 and a stone gate socket or altar fragment(?) in wall 13. Pit 2 (J-2) containing the pithos proved to be connected with this construction phase. The pithos after cleaning and conservation was dated to the Early Byzantine period (this supersedes the erroneous dating from the 2009 season). The pit cut the late antique wall 12 which may have formed a corner with wall 18. It had already been suggested in the report from the previous season that walls 12 and possibly 11 had formed part of architectural complex IV. The outlines and depth of pit 2 remained untraceable except for the dark-brown discoloration of the fill of the pithos (top recorded at 17.19 m, bottom at 16.03 m). Thus, it was possible to establish that the pithos and the pit were located in the southwestern corner of architectural complex IV. The vessel was preserved in situ to a height of 1.15 m, but without a single sherd surviving from the rim. The inside walls of the vessel had a bright red substance adhering to them, possibly representing the original content which could have been wine. Samples for chromatographic analysis were secured and the object documented. The fill of the pithos also contained a base fragment of a red-slipped bowl with stamped bird ornament. A preparatory sweep of squares 12-13 prior to the excavations this year revealed a light gray discoloration. This turned out to be a roughly circular pit (J-5), 1.70 m (E-W) by 1.50 m (N-S). It was located at the border of squares 12 and 13, approximately 1.40 m (eastern edge of the pit) from the eastern limits of the two squares. Its depth was about 0.40 m (bottom recorded at 16.82 m). The fill contained two diagnostic glass vessel rims which dated the pit to the Early Byzantine period. The Early Byzantine layer in which the pit was sunk was subsequently excavated down to approximately 16.85 m or the level of the stone tumble in square 12 and the top of the layer connected with the ruins of architectural complex IV in square 13. The complex, as described above, comprised walls 8, 9, 10 and 13 discovered in 2009 and walls 18, 29 and possibly 30 and 31 cleared this year. Presumably also a sewage channel (channel 2) and pavement 4. Further exploration in squares 13-14 uncovered the architectural remains of complex II. This was a Late Roman house consisting of two rooms (A and B), a staircase and pavement. The investigations were limited to the western and northern parts of complex II, that is, room (locus) A and the area to the north of it where the pavement uncovered last year was now cleared completely. Another section of wall 12 was uncovered to the south of pit 2 (J-2) which cut through it (see above). Its thickness was 0.55 m and it was preserved for 4.60 m to the south of the corner that it formed with wall 11 (southeastern corner of room A), ending already in square 16 where it lay under a wedge of fill from an undisturbed cultural layer outside the limits of the old trench XIV). At the southern end, wall 12 or its corner was destroyed. It is possible that one of the stones in the southwestern corner of wall 28 has been preserved in situ; it appears to have been reused in the construction of the contemporary wall 24. Another wall (wall 28) was recorded to the north of wall 12, 2.70 m away from it. It is the north wall of room A of architectural complex II (SK II). On the east, the locus is delimited by wall 11. Wall 28 was 0.55 m wide, like wall 12, and it extended at least 4.20 m to the west of the corner that it formed with wall 11 (northeastern corner of room A). Its southern end was destroyed like the southern end of wall 12. It is in such poor condition overall that only about 1.30 m of its course can be reconstructed. The top of this wall was recorded at approximately 16.80 m.
Exploration in room A (locus A) was terminated this season at 16.57 m.
Pavement 3, uncovered partly in 2009, was also part of architectural complex II. It extended from the northern façade of wall 28 over an area 3.30 m long. Its width from east to west was 3.50 m, but it should be kept in mind that the eastern edge was partly destroyed by feature 1 (O-1), a dugout identified as belonging to the Saltovo-Mayaki Culture, and the western end by a modern pit. The paving was made of big limestone slabs with medium-sized slabs fitted in the gaps. The pavement slips slightly toward the west (16.90 m at the eastern end, 16.65 m at the western one). In this part of trench XXVII, as in squares 10-11, first the remains of modern fill were removed following the mechanical clearing of the surface layer. Practically the entire area (with the exception of the eastern end of squares 15-16, approximately 1.20 m wide, and the southwestern part of square 16, as well as the northeastern corner of square 15, which were already outside Gajdukevich’s old trench XIV) was covered with heavily disturbed modern layers dating from the 1940s through the 1970s. These layers were formed as the old trench was filled in, hence the mixed assemblage including asbestine tile fragments and modern glass bottles immediately next to objects of ancient provenience. The bottom of these layers was not reached this season (the level reached was 16.54 m in the western part of squares 17 and 18 and 16.25 m in the eastern part of squares 15 and 16). In the northern part of square 15, time constraints caused the exploration of the fill of trench XIV to be interrupted at the level of 17.10 m.
The tops of ancient walls appeared at 16.90–16.80 m in squares 16, 17 and 18. Initially, walls 21 and 22 were thought to be the Late Roman cellars that Gajdukevich had discovered (walls 51/62, 55, 52 and 70), but a correlation of plans from trenches XIV and XXVII led to the rejection of this idea. Wall 22 was the only one which appeared to correspond with wall 55. Other evidence, like anti-damp roofing paper in the bondwork of wall 21 indicated its modern provenience and this wall formed a corner with wall 22. In the case of walls 19, 20, 23, 24 and 27, their modern origin was confirmed either by the use of modern bricks or cut stone in their structure, or else by their founding on a layer containing artifacts of 20th century date. It is likely that these structures were built at least partly of the stone salvaged from the cellars discovered and described by Gajdukevich. 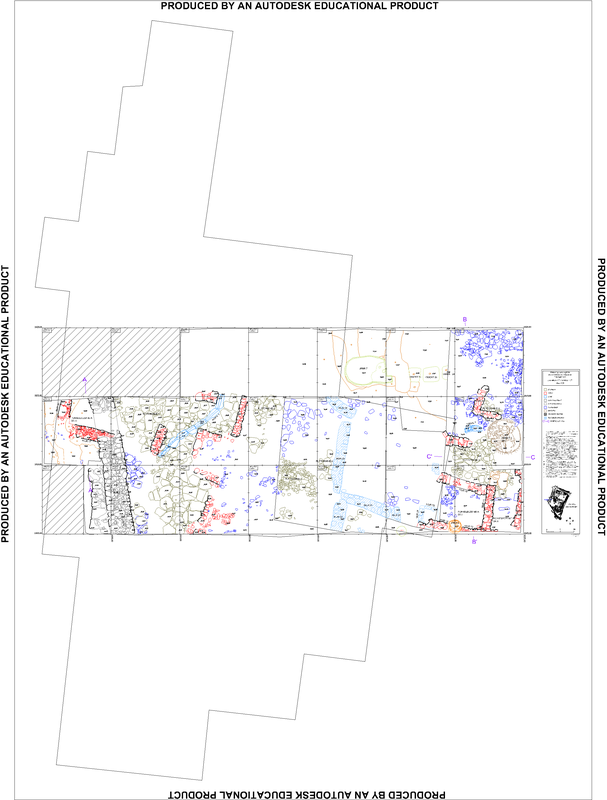 Undisturbed cultural layers in squares 15, 16 and 17 were present only outside the limits of the old trench XIV. In square 16, it was a wedge by the southern trench wall, at approximately 17.25 m by the eastern edge of the trench and 16.60 m by the western edge, starting 0.70 m to the west of the eastern edge of the square and spreading toward the west, where it was already 1.20 m wide. This layer extended by about 0.30 m into the neighboring square 18. A depression discovered at the level of 16.60 m proved to be the mouth of a pit (J-9). Pit 9 (J-9) was located approximately 0.80 m to the east of the western border of square 16 and was concealed partly under the south trench wall. The mouth was approximately round, 0.74 m (E-W) and 0.80 m (N-S). It was a double pit of figure-eight shape in section with a distinct narrowing at about 15.15 m. Its depth was approximately 2.80 m, the first chamber being about 1.45 m deep and the second one about 1.35 m. The first chamber measured 1.30 m (E-W) and 1.70 m (N-S), the second 1.60 m (E-W) and 1.20 m (N-S). It must have originally had a wooden lid (no archaeological proof of this lid could be traced), which before decaying completely must have allowed soil accumulation to build up on top of it, creating a hollow in effect. The double-chamber form suggests grain storage, the first chamber containing grain for the winter and the second grain for sowing in the field in the following spring. The two would have had to be separated by another wooden lid, which has also left no archaeological traces. The cultural layers that pit 9 (J-9) cut through can be observed perfectly well in the northern profile. It comes as no surprise that the fill contained some residual material, but the overall dating of the pit is to the Late Roman period. A section about 3 m wide was explored in the western part of square 20, continuing investigations which had been completed in the eastern part of the square (the western part of square 8 before the renumbering) last year and which were followed by a reconstruction of the curtain wall carried out by Ukrainian restorers and paid for by the Polish side. An Ukrainian team headed by Prof. V. N. Zin’ko explored square 20 down to approximately 16.37 m in July 2010. Polish archaeological work in the square started with a sweeping of the trench surface in order to determine the exact outlines of Gajdukevich’s trench XIV and the extent of undisturbed cultural layers which consisted of the washed out remains of a collapsed wall of dried brick. This tumble should be connected with the collapse of the defenses. The second construction phase of the fortifications and more specifically the large blocks of broken stone forming it, set directly on the ground, were most likely only the foundation footing for an additional mantle of dried brick that was added to the original defenses from the first phase. A distinct dark discoloration was traced at the border of the two layers, in an undisturbed cultural layer at about 16.33 m. This was first identified as the top of a pit (J-4), but the exploration of this locus demonstrated that if it were indeed a pit, it would have been only 0.15 m deep (bottom at 16.17 m). The preserved shape was near to an oval and was located about 1.10 m (its southern edge) from the southern border of the square and about 0.40 m (the western edge) from the western one. The feature measured 1.00 m (E-W) and 1.20 m (N-S). The assemblage from this feature appeared to be mixed. The mixing of material already after the deposits had been sealed, in pit 4 as well as in the fill of Gajdukevich’s trench, was due to the proximity of the pit to the trench. For example, an almost complete black-glazed kylix was discovered in the fill of the old trench XIV, broken into 13 joining fragments found close together. Evidently it must have come from undisturbed cultural layers to the west of Gajdukevich’s old trench and was moved in the course of post-depositional processes. This situation makes the dating of the feature difficult, although an early date seems likely hypothetically. Exploration of the fill of Gajdukevich’s old trench to the west of the curtain of the defense wall ended at 15.71 m by the northern edge of square 20 and at 15.58 m at the southern edge. The layer yielded a fragment of black-glazed kylix, fragment of the rim of a black-glazed vessel and a lamp fragment. Gajdukevich had stopped digging on the top of a layer of burning recorded at 15.84 m by the defense wall (only to the west of the defense wall, in a section about 0.50 m wide next to the northern trench wall, did he excavate to the level of 15.71 m, possibly in an effort to test the founding of the curtain wall) and dropping to 15.69 m to the west, by the western trench wall of square 20. Seen in the northern trench wall, this layer has a thickness of approximately 0.03-0.05 m. In the southern trench wall, the layer is 0.02 m thick by the western façade of the curtain wall, increasing to about 0.08 m in a westerly direction. Approximately 2.60 m west of the first construction stage of the curtain of the fortifications, the layer of burning drops to 15.39 m and further is visible in the trench wall. It should be connected with the destruction of the first construction stage of the defense wall curtain. Exploration of the western end of square 20 which had not been excavated by Gajdukevich showed that superimposed on the layer of burning was a layer of washed out dried bricks coming from the destruction of the fortifications. The layer of burning yielded sherds of amphorae from Chios, Tazos, Samos and Lesbos, as well as a large group of 5th century BC amphorae of unidentified provenance. Black-glazed pottery clearly prevailed among the tableware. Underneath the layer of burning was another level of washed out bricks lying on top of another level of burning, the top of which was recorded at 15.40 m and the bottom at 15.35 m. Both layers of burning should be connected with the destruction of locus A, the southwestern corner of which, between walls 26 and 17, was uncovered this season. Locus A was part of architectural complex III. Superimposed on the top of wall 17 is the curtain of the defense wall (wall 7). This wall, which is aligned NW-SE (deflected about 20º from the E-W axis), survives to a level of 15.61-15.54 m. Three building courses are preserved in the northern façade, four in the southern one. This wall was merely a foundation for the dried-brick wall raised on top of it. Wall 17 was 0.85 m wide. A section 2.30 m long has been traced; about 1.65 m of its length can be seen extending past the western façade of the defense wall. The foundation level of wall 17 where it could be observed was recorded at 15.46 m at the eastern end and 15.33 m at the western one. Wall 17 originally formed a corner with wall 26, but the corner itself has not been preserved. It must have been built of large stones later reused in the construction of the fortifications. This idea is confirmed by the finding of joining pottery sherds from the same vessels both in locus A and outside walls 17 and 26. The material must have been disturbed when blocks were being salvaged for the construction of the defenses (wall 7). Wall 26, which is aligned N–S, disappears into the northern trench wall of square 20; the visible section is approximately 1.20 m long. Its width is the same as in the case of wall 17, that is, about 0.85 m. The western façade of wall 26 consists now of just two limestone slabs forming the one preserved building course. The eastern façade is preserved to the level of the second course. The foundation level of the wall was measured at 15.38 m in the northern part and 15.30 m in the southern one. Like wall 17, wall 26 was merely a foundation for a wall of dried bricks. It should be noted at this point that a digital reconstruction of the site plan allows the walls of locus A, especially wall 26, to be connected with the walls of Archaic house A discovered nearby by V. F. Gajdukevich. On these grounds one should reconsider the earlier theory that houses of the type represented by House A were functioning in the Bosporan area during the Archaic period. It seems now that we are dealing with an ordinary Greek house. Further fieldwork is needed to resolve the issue. Outside locus A excavations were interrupted at approximately 15.40 m, just when traces of burning in the form of dark discolorations started to appear in the northwestern corner of the square. The western trench wall demonstrates at this level an ellipsoid discoloration of rusty brown color, measuring 0.15 m (length) by 0.07 m (height). The top of this discoloration was recorded at 15.53 m, the bottom at 15.46 m. It should presumably be interpreted as a hearth, although its connection with locus A and the Archaic structure to which it belonged is at this point in the excavations difficult to interpret in detail. The fill inside locus A was excavated separately down until 15.28 m. A walking level connected with the occupation of locus A and the Archaic house in general was noted outside the room about 0.40 m the south of the southern façade of wall 17, running alongside the curtain of the later defenses. The level extended for approximately 1.20 m, reaching the south trench wall in square 20. The width of the recorded level was about 1.40 m E-W starting from the western facade of the curtain of the fortifications. It was recorded at approximately 15.40 m by the western side of the defenses, sloping away to the west, where its vestiges were noted at 15.33 m. Excavations in square 20 were interrupted on the level of this walking surface. During the last week of the expedition (22-29 August) the team carried out preliminary preservation, preparing for a conservation program aimed at preserving and partly restoring part of the excavated stone structures and protecting the trench permanently. Samples of the stone from the ancient structures were taken for relevant laboratory testing in Poland to choose the optimal methods and preparations needed for permanent protection from the elements. In keeping with the signed agreement, the stone structures discovered and conserved by the Polish mission will be part of an open-air display initiating the project for the organizing of an archaeological park at Tyritake. Based on the preliminary work carried out this year, the Polish side envisions the establishment of a separate Polish conservation team to begin activities in the 2011 season. The team will be acting concurrently with the Polish archaeological expedition and will provide field conservation in trenches explored by Polish archaeologists.